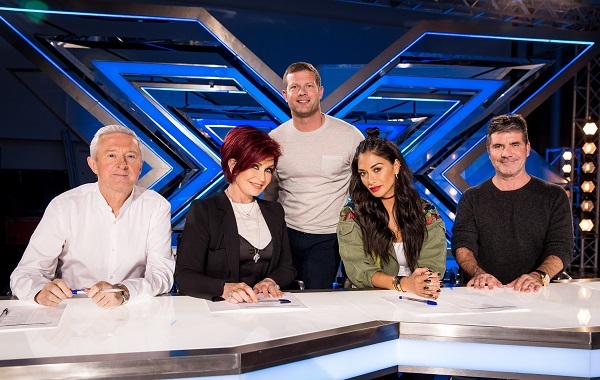 LOS ANGELES – August 23, 2017 – AXS TV is proud to announce the return of the hit singing competition THE X FACTOR UK for its fourth consecutive year. The network will air the upcoming landmark 14th season, premiering as a two-day event on Sunday, September 3 and Monday, September 4, at 9pE/6pP. Each episode will air on AXS TV 24 hours after the respective UK broadcasts, with encore airings every night, directly following the network premieres. Leading up to the premiere, the network will present an X FACTOR UK Marathon on Sunday, August 27, starting at 3:30pE, giving viewers a chance to relive some of the series’ most unforgettable moments in an all-day block highlighting XTRA FACTOR specials and THE WINNER’S STORY profiles. THE X FACTOR UK is hosted by series mainstay Dermot O’Leary, and will once again feature one of the most beloved judging panels in X FACTOR history as celebrated producer, music expert, and series creator Simon Cowell is re-joined by music manager, TV host and original X FACTOR UK judge Sharon Osbourne; as well as solo artist standout Nicole Scherzinger, who helped guide pop vocalist Matt Terry to victory in season 13. Rounding out the esteemed judging panel is music manager Louis Walsh. Over the past decade, THE X FACTOR UK has led the charge in discovering international superstars, with X FACTOR UK artists selling a total of more than 250 million records worldwide and securing more than 200 No.1s. The program’s unprecedented legacy includes chart-topping acts such as the global sensation One Direction; GRAMMY®-nominated superstar Leona Lewis; 2012 winner, James Arthur, who’s single “Say You Won’t Let Go” went double-platinum in both the UK and the US and has sold more than eight million copies worldwide to date; multi-platinum solo artist Olly Murs; and Little Mix, who were the first group to win the competition, and have gone on to become one of the most successful British female acts of all time. Known for its powerhouse performances, lavish sets, and impressive wardrobes, THE X FACTOR UK stands out as one of the first stops for major recording artists to debut their latest hit singles. In recent seasons, AXS TV’s viewers have been among the first in North America to hear Adele’s “Hello;” Coldplay’s “Adventure Of A Lifetime;” Taylor Swift’s “Shake It Off;” Maroon 5’s “Animals;” Sam Smith’s “Stay With Me;” One Direction’s “Where Do Broken Hearts Go,” and Ed Sheeran’s “Thinking Out Loud;” among many others. THE X FACTOR is a global hit entertainment format co-produced by Syco Entertainment and Thames TV (part of FremantleMedia UK). THE X FACTOR franchise has discovered and launched more international breakout artists than any other singing competition series, with X FACTOR artists amassing a combined total of more than 250 million record sales. AXS TV is the first American television network to air the UK edition of the show. The X Factor UK 2016 aired in 165 territories. Launched in July 2012 by visionary entrepreneur CEO Mark Cuban, AXS TV is dedicated to providing groundbreaking music programming, stand-up comedy performances from today’s top comedians, and hard-hitting mixed martial arts promotions. The network’s hit franchise series include THE BIG INTERVIEW with Dan Rather; ROCK & ROLL ROAD TRIP WITH SAMMY HAGAR; and AXS TV FIGHTS.